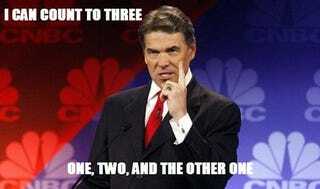 Hi there, Governor Perry. I want to talk to you about SB5. As I write this, I'll make sure to use short words so that you can understand what I'm saying. Also, I'll avoid my customary use of itemized, numbered lists, since I know numbers confuse you, especially when there are at least three of them. What I wanted to make sure you understand is that even if your special session allows this horrible, awful, regressive bill to pass, you still lose. There's no version of this where you come out on top. You will lose, and there's nothing you can do about it. Ultimately, you've already lost. I know you seek to overturn Roe v. Wade and return us to the dark, horrifying days when women had to put themselves in very real and very terrifying danger from all quarters if they sought to have any agency over their bodies. I know you seek a return to a time where abortions weren't reduced in any meaningful number from where they are now, but where women were stigmatized and made to feel worthless on account of their "promiscuity." I know you seek to effectively enact Margaret Atwood's The Handmaid's Tale. Moreover, I know you think you'll win. In every state that has tried these sorts of TRAP laws, nary a whimper has been raised against them (or so has gone the narrative), and women's reproductive rights have fallen by the wayside. In every state that has passed these laws, nobody ever really fought back against your breed of evil — not in any readily apparent way, at least. While activists on the ground spent their blood, sweat, and tears trying to stop you, either they were too few in number or they were betrayed by their elected officials, and so their fight went sadly unrecognized. For all intents and purposes, in every state, the voices calling for basic goodness and human decency have (as far as the national media is concerned, anyway) seemed to acquiesce with barely a whimper. Every state except one: your own. The fight against SB5 means something more to us than I think you realize. This is our Alamo. This is our Wake Island. This is a probably-doomed fight against hopeless, overwhelming odds, but a necessary fight that will not be forgotten, and a fight we undertake gladly. This is a battle whose echoes won't be forgotten, the names of Davis, and Watson, and Van de Putte reminding us that heroes still exist in American politics. SB5 is our rallying cry, and it is one we will carry with us in every coming battle against politicians who seek to assert institutionalized oppression under the dubious guise of "traditional values." And I have to say...we couldn't have done it without your help. You really gift-wrapped this for us in a lot of ways, didn't you? Your dirty tricks, your disrespect for the democratic process, your attempted use of strong-arm tactics against lawful protesters, and most of all, your blatant attempt to outright lie in order to get this bill passed (apparently forgetting about the whole "video evidence" thing) — well, that turned something important into something legendary, now didn't it? You've done us a great service, and for that small favor, we do need to thank you. What you fail to realize is that your time has come and gone. It's inevitable; the country's demographics are shifting in such a way that your day will meet its end as surely as the sun rises in the East and as inevitably as summer turns to autumn. Fifty years ago, we knew California and Illinois were battleground states. Twelve years ago, we knew Virginia and Colorado were reliably red states that could never go blue in two consecutive national elections. Imagine what we'll know five years from now? Younger generations and people of color are no longer buying what you're selling...which is a problem for you, since every year, our influence waxes, and with it, yours wanes. Soon enough, it'll be your turn; within 15 years, Texas will be in play. Within 30, it will be as reliably blue as Illinois is now. Your reign of influence already comes with an expiration date — you just haven't realized it yet. You may look at the Tea Party, and the unprecedented assault on women's reproductive rights, and see a new conservative movement on the rise. But you're only deluding yourself. Those of us who can see clearly see the last embers of an evil, doomed philosophy raging against the dying of the light. I look to the future and I see a world where you and yours will not be able to stop or even delay the march towards progress, towards a better tomorrow. I look forward and I see hope. The whole of human history is a corkscrew towards liberalism; it may double back on itself from time to time, but it moves inexorably forward. You could no more stop that than you could spit to extinguish the sun. So when your special session gets called, and you probably get this bill passed, be sure to celebrate. I want you to feel happy; really, I do. Because I know the truth: your time is coming, and when it does, there will be no loopholes to hide behind, no dirty tricks that will save your political career. Your poisonous ideology will fall, as did slavery, as did segregation, as did child labor, and as has or will every instance of bullying and demagoguery the powerful have ever foisted on those who your kind thought were powerless to resist you. So enjoy this hollow victory. Just know that soon, you will look back on it as one of your last. PS. Sorry I couldn't keep to my "short words" promise. If you need help understanding what I said here, you could probably ask an intern to explain it to you. Or any six-year-old.